The nucleotide-binding oligomerization domain-like receptor (NLR) family of proteins is involved in the regulation of innate immunity responses. These proteins sense pathogen-associated molecular patterns (PAMPs) in the cytosol as well as the host-derived signals known as damage-associated molecular patterns (DAMPs). Certain NLRs induce the assembly of large caspase-1-activating complexes called inflammasomes [1,2]. Activation of caspase-1 through autoproteolytic maturation leads to the processing and secretion of the proinflammatory cytokines interleukin-1β (IL-1β) and IL-18. So far, four inflammasomes have been identified and defined by the NLR protein that they contain; the NLRP1/NALP1b inflammasome ; the NLRC4/IPAF inflammasome [4,5]; the NLRP3/NALP3 inflammasome ; and the AIM2 (absent in melanoma 2) containing inflammasome [7,8]. IL-1β and IL-18 are related cytokines that cause a wide variety of biological efffects associated with infection, inflammation and autoimmune processes. IL-1β participates in the generation of systemic and local responses to infection and injury by generating fever, activating lymphocytes and by promoting leukocyte infiltration at sites of infection or injury. IL-18 induces IFN-γ production and contributes to T-helper 1 (Th1) cell polarization. Maturation of IL-1β and IL-18 by cleavage with caspase-1 is a prerequisite for inducing the immune responses. Caspase-1 itself is synthesized as an inactive 45 kDa zymogen (pro-caspase-1) that undergoes autocatalytic processing following an appropriate stimulus. The active form of the enzyme comprises the subunits p20 and p10 . Caspase-1 is activated within the inflammasome multiprotein complex through interaction with ASC (apoptosis-associated speck-like protein containing a carboxy-terminal CARD), a bipartite adapter protein that bridges NLRs and caspase-1 . It is now generally accepted that activation and release of IL-1β requires two distinct signals. The nature of these signals in vivo during infection or inflammation is not completely defined. However, in vitro studies indicate that the first signal can be triggered by various PAMPs following Toll-like receptor (TLR) activation which induces the synthesis of pro-IL-1β. The second signal is provided by the activation of the inflammasome and caspase-1 leading to IL-1β processing. The requirement for a second signal for IL-1β maturation might constitute a fail-safe mechanism to ensure that induction of potent inflammatory responses occurs only in the presence of a bona fide stimulus, such as pathogen infection and/or tissue injury. NLRP1 assembles a multimolecular complex inflammsome with caspase-1, caspase-5, ASC, and a triphosphate ribonucleotide [1,2,10]. NLRP1 directly binds to ASC, via its pyrin (PYD) domain and directly to caspase-1 via its CARD domain. Activity of the NLRP1 inflammasome is induced by muramyl dipeptide (MDP) and anthrax lethal toxin (mouse NLRP1b) . Studies have indicated that NOD2 is needed for in vitro sensing of both MDP and anthrax lethal toxin. Activation of the NLRP1 inflammasome is tightly linked to the apoptotic pathway. The anti-apoptotic proteins Bcl-2 and Bcl-X(L) bind NLRP1 in resting conditions, suppressing caspase-1 activation and IL-1β secretion. Several NLRP1 gene variations have been associated with an increased risk of autoimmune disorders and vitiligo, an autoimmune condition that results in patchy changes in skin pigmentation. However, the precise role of the NLRP1 inflammasome in immune responses remains poorly understood. NLRC4 (also known as IPAF) is the only member of the NLRC family currently known to assemble an inflammasome [2,4,5]. NLRC4 associates with pro–caspase-1 with its CARD domain without the need of an adaptor protein, and interaction with ASC is required for robust IL-1β secretion. Oligomerization of NLRC4 is triggered by cytosolic flagellin from a variety of bacteria such as Salmonella typhimurium, Legionella pneumophila, Shigella flexneri, and Pseudomonas aeruginosa or other stimuli possibly delivered by a bacterial secretion system (type III or type IV). NAIP5, another member of the NLR family, appears to be involved in the recognition of the ligand under certain circumstances . Flagellin is an interesting ligand triggering both TLR5 and the NLRC4 inflammasome . As such, flagellin is likely to independently signal the production of cytokines and drive their maturation via caspase-1. Among the inflammasomes, NLRP3 inflammasome is the most studied. Its activation in macrophages can be achieved with a plethora of PAMPs, such as liposaccharide, peptidoglycan, and bacterial nucleic acids, provided the cells are exposed to ATP. Indeed, in the absence of ATP, macrophages stimulated with LPS produce large quantities of pro-IL-1β, but release little mature cytokine to the medium. ATP and certain bacterial toxins, such as nigericin and maitotoxin, cause a change in the intracellular ion composition leading to the activation of the NLRP3 inflammasome. The effect of ATP is mediated by the purinergic P2X7 receptor together with pannexin, which causes a rapid potassium efflux from the cytosol upon activation . Crystals of monosodium urate (MSU) and calcium phosphate dihydrate (CPPD) are known to activate caspase-1 in a NLRP3-dependent manner . Deposition of MSU and CPPD crystals in joints is responsible for the inflammatory conditions gout and pseudogout, respectively, implicating NLRP3 in their etiology. Uric acid in addition is released into the extracellular milieu by necrotic cells, suggesting an important role of NLRP3 in the detection of endogenous ‘danger’ signal. Crystalline silica and asbestos are known to activate the NLRP3 inflammasome, implicating its role in the pathogenesis of silicosis and asbestosis [15-17]. Aluminium salt (alum) crystals can also activate the NLRP3 inflammasome, albeit in the presence of PAMPs such as LPS [17-19]. Phagocytosis of crystals leads to lysosomal swelling and damage. The lysosomal perturbation together with the release of cathepsin B, a lysosomal cysteine protease, result in the activation of the NLRP3 inflammasome . AIM2 (absent in melanoma 2), a receptor for cytoplasmic DNA, forms an inflammasome with its ligand and ASC to activate caspase-1 [20-22]. AIM2 is an interferon-inducible HIN-200 family member that contains an amino-terminal pyrin domain and a carboxy-terminal oligonucleotide/oligosaccharide-binding domain. AIM2 senses cytoplasmic double-stranded DNA through its oligonucleotide/ oligosaccharide-binding domain and interacts with ASC via its pyrin domain to activate caspase-1. The interaction of AIM2 with ASC also leads to the formation of the ASC pyroptosome, which induces pyroptotic cell death in cells containing caspase-1. AIM2 is necessary and sufficient for inflammasome activation in reponse to cytoplasmic DNA. Clearly, inflammasomes fulfill a central role in innate immunity. They detect and respond to bacterial components, ‘danger signals’ and potentially dangerous cytoplasmic DNA. Further understanding on how they are activated should provide new insights into the mechanism of host defense and the pathogenesis of autoimmune diseases. 1. Schroder K. & Tschopp J., 2010. The inflammasomes. Cell 140(6):821-32. 2. Franchi L. et al., 2012. Sensing and reacting to microbes through the inflammasomes. Nat Immunol 13(4)325-32. 3. Boyden ED & Dietrich WF., 2006. Nalp1b controls mouse macrophage susceptibility to anthrax lethal toxin. Nat Genet. 38(2):240-4. 4. Miao EA. et al., 2006. Cytoplasmic flagellin activates caspase-1 and secretion of interleukin 1beta via Ipaf. Nat Immunol. 7(6):569-75. 5. Zhao Y. et al., 2011. The NLRC4 inflammasome receptors for bacterial flagellin and type III secretion apparatus. Nature. 477(7366): 596-600. 6. Martinon F. et al., 2006. Gout-associated uric acid crystals activate the NALP3 inflammasome. Nature. 440(7081):237-41. 7. Hornung V. et al., 2009. 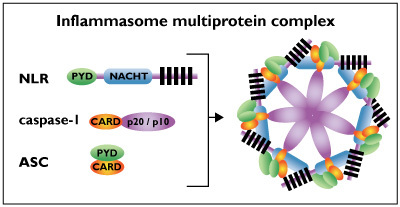 AIM2 recognizes cytosolic dsDNA and forms a caspase-1-activating inflammasome with ASC. Nature. 458(7237):514-8. 8. Fernandes-Alnemri T. et al., 2009. AIM2 activates the inflammasome and cell death in response to cytoplasmic DNA. Nature. 458(7237):509-13. 9. Mariathasan S & Monack DM., 2007. Inflammasome adaptors and sensors: intracellular regulators of infection and inflammation. Nat Rev Immunol. 7(1):31-40. 10. Martinon F, & Tschopp J., 2004. Inflammatory caspases: linking an intracellular innate immune system to autoinflammatory diseases. Cell. 117(5):561-74. 10. Davies B. et al., 2011.The inflammasome NLRs in immunity, inflammation, and associated diseases. Annu Rev Immunol 23(29)707-35. 11. Kofoed EM. & Vance RE., 2011. Innate immune recognition of bacterial ligands by NAILPs determines inflammasome specificity. Nature. 477(7366):592-5. 12. Kupz A., et al., 2012. NLRC4 inflammasomes in dendritic cells regulate noncognate effector function by memory CD8+ T cells. Nat Immunol. 13(2):162-9. 13. Pelegrin P, & Surprenant A., 2007. Pannexin-1 couples to maitotoxin- and nigericin-induced interleukin-1beta release through a dye uptake-independent pathway. J Biol Chem. 282(4):2386-94. 14. Kanneganti TD, et al., 2007. Pannexin-1-mediated recognition of bacterial molecules activates the cryopyrin inflammasome independent of Toll-like receptor signaling. Immunity. 26(4):433-43. 15. Martinon F. et al., 2006. Gout-associated uric acid crystals activate the NALP3 inflammasome. Nature. 440(7081):237-41. 16. Dostert C. et al., 2008. Innate immune activation through Nalp3 inflammasome sensing of asbestos and silica. Science. 320(5876):674-7. 17. Cassel SL. et al., 2008. The Nalp3 inflammasome is essential for the development of silicosis. Proc Natl Acad Sci U S A. 105(26):9035-40. 18. Hornung V. et al., 2008. Silica crystals and aluminum salts activate the NALP3 inflammasome through phagosomal destabilization. Nat Immunol. 9(8):847-56. 19. Eisenbarth SC. et al., 2008. Crucial role for the Nalp3 inflammasome in the immunostimulatory properties of aluminium adjuvants. Nature. 453(7198):1122-6. 20. Li H. et al., 2008. Cutting edge: inflammasome activation by alum and alum's adjuvant effect are mediated by NLRP3. J Immunol. 181(1):17-21. 21. Hornung V. et al., 2009. AIM2 recognizes cytosolic dsDNA and forms a caspase-1-activating inflammasome with ASC. Nature. 458(7237):514-8. 22. Fernandes-Alnemri T. et al., 2009. 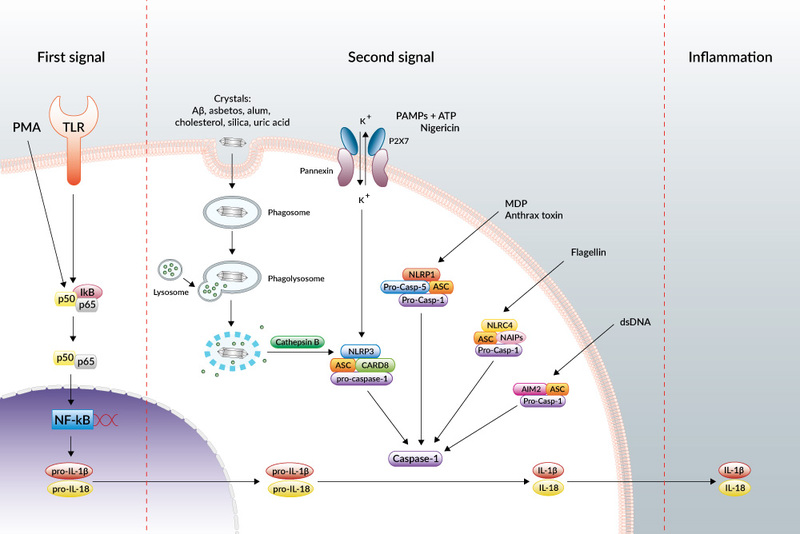 AIM2 activates the inflammasome and cell death in response to cytoplasmic DNA. Nature.458(7237):509-13. 23. Bürckstümmer T. et al., 2009. An orthogonal proteomic-genomic screen identifies AIM2 as a cytoplasmic DNA sensor for the inflammasome. Nat Immunol. 10(3):266-72.